Walter Percy Chrysler (1875–1940) was born in Wamego on April 2, 1875. His father, Henry, was an American Civil War veteran who was a locomotive engineer for the Kansas Pacific Railway and its successor, the Union Pacific Railroad. 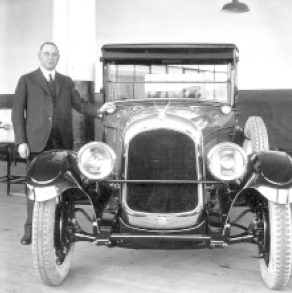 Walter P. Chrysler was an American machinist, railroad mechanic and manager, automotive industry executive, and founder of the Chrysler Corporation. The Wamego Historic Museum in Wamego City Park includes a 1950 Chrysler Coupe with original paint, tires and upholstery and only 31,000 miles on the odometer.